W H Laboratories perform extensive laboratory analysis and testing on components from all aspects of industry, power and petrochemical sources. W H Laboratories can apply its facilities and expertise to quickly determine the root cause of your equipment problems, and assess how these problems can be corrected. We specialize in solutions to your problems. What happens when things go wrong? Failures of machinery and structures often result in property damage, business interruption, pollution and personal injuries. 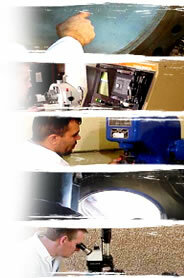 We analyze the potential results and costs of failures, and advise on run, repair or replace decisions.